It Wasn’t Really an Assignment . . .
Home » Word on the Hill » It Wasn’t Really an Assignment . . .
Way back in TGC IV, we were studying a book (an epic, rather), which was quickly going to become one of my favourites: Homer’s Iliad. The Iliad tells the story of the Greco-Persian War, starting with Paris (also known as Alexander) and Helen, a love story with which most people are familiar. It begins with the famous line: “Sing, Muses, of the wrath of Achilles,” and the theme that opens the epic is part of what inspired this assignment. It wasn’t really an assignment — it actually started as a joke. One day in class we were discussing the red-figuring method of embellishing pottery when Mrs. Plummer said she’d love to see what we could do with that. I decided I would try. So, I picked a random pot (I have a lot of funny little handmade clay pots around my house) and began to redecorate it. 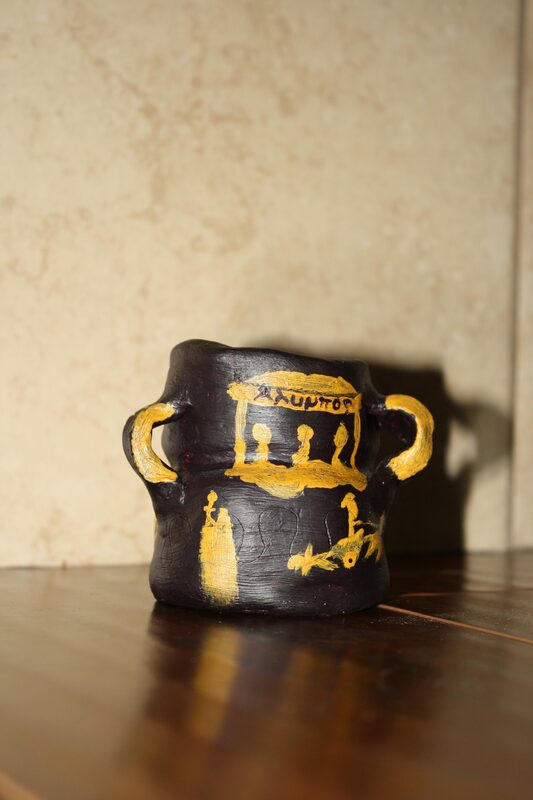 The stylizing is clearly not perfect, but I’m no Greek potter! My pot has three sides, each of which represents one of the critical closing scenes of The Iliad. The first side illustrates the final battle between Achilles and Hector. Hector is betrayed by the gods in this battle, and Achilles triumphs easily. Athena is the only god represented here because she is the only god involved in Hector’s ultimate defeat. On the second side you see in this picture, Achilles sits in his chariot, dragging the dead body of Hector around the city. Priam watches from the city wall, and Zeus, Apollo and Poseidon from Olympus (Note: the Greek word Άλυμπος is displayed above the scene showing the gods–this simply means ‘Olympus,’ which is, of course, where the gods live). Finally, the third side depicts King Priam, begging Achilles for the dead body of his son. Achilles has been abusing and mutilating the corpse for a few days now, but Apollo has been protecting it from rot and scavengers. After twelve days, Apollo finally convinces Zeus that Achilles must allow Priam to ransom Hector’s corpse. The deed is done and Hector is returned to the city to be burned on a pyre. It’s not the happiest of tales nor the best depiction of the Iliad, given the excellent stick figures. But my red-figure pot conveys the points well, holds some interesting meaning and proved to be a fun activity as well.